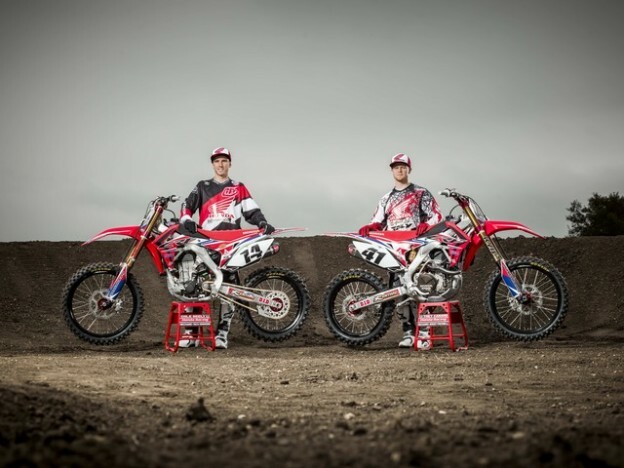 Al Lamb’s Dallas Honda -- On November 17, 2014, American Honda officially announced and introduced the 2015 Team Honda lineup at the Castillo Ranch Supercross track during a press event. The spotlight fixated on factory riders Trey Canard and Cole Seely for the race program’s profile, as the team prepares and enthusiastically counts down the days for the 2015 AMA Supercross season. Honda Team Manager, Dan Betley, kicked off the day’s press event highlighting the triumphant 2014 season finale and reviewing the off-season developments for continuous advancements of the race program. In conjunction with outlining modified processes, Betley announced new personnel, consisting of two significant HRC principals, Motocross Representative Director, Keisuke Inomoto, and Motocross Technical Director, Yasuhiro Yokoyama. Betley continued on to applaud returning team member, Canard, who has remained with Team Honda throughout his entire 450 career, and welcomed premier-class rookie, Seely, to the Honda Team. Canard and Seely congregated with media representatives for one-on-one interviews and photos after the introductions and technical overview of the 2015 Team Honda CRF450R. Canard and Seely ended the event with photos on the trackand video sessions for the commentators and team sponsors. The 2015 AMA Supercross season is scheduled for kick off on January 3rd, 2015 at Angel Stadium of Anaheim by Team Honda.